How Will Tax Reform Affect My Refund? I am a single, senior woman living in Kansas and I have just filed my taxes through TurboTax. Everything I read about the new tax code led me to believe I would be paying less taxes, but not so. At the federal level I will receive a refund but it is about 18% less than last year, according to TurboTax. At the state level I have to pay $700 additional taxes. This is because I took the standard deduction on my federal return, which is a higher level of deduction for me than itemizing. I didn't know this when I filed, but Kansas is one of many states that does not allow you to itemize on your state return if you did not itemize on your federal return. So I could only take the Kansas standard deduction. Itemizing on the state return would have been much better. 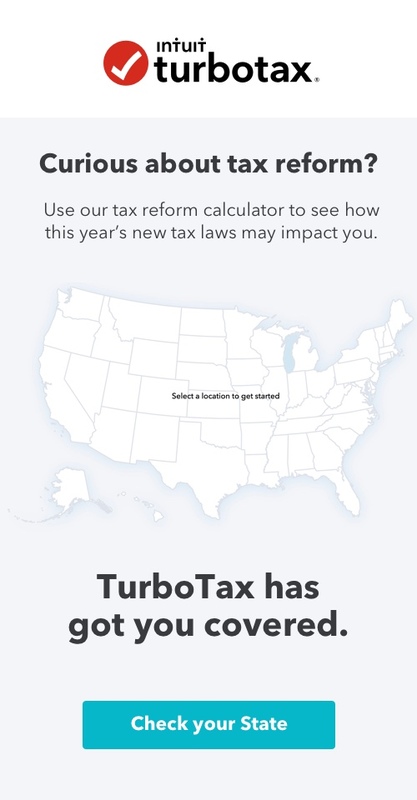 I live in a high-tax Kansas City suburb and for me an additional $700 is significant. I am not happy. Use the Home & Business (CD or Download Version) or Turbo Tax Online "Self Employed"
This is the conundrum many face this year as a result of the New Tax Law. Increasing the Standard Deduction (doubling it) has had some profound impacts. 1. It will reduce the number of Tax Returns Itemizing by a factor of 6. In other words approximately 30% of all taxpayers itemized in 2017; in 2018 that figure drops to around 5%. The obvioius advantage to this change is simplicity: less paperwork, calculations and audits when Shedule A drops off. Shedule A is ripe for an audit....The Standard Deduction is not. 2. It would almost appear as if the Feds act completely independently of the States when it comes to tax. Recall most states use Federal AGI as a starting point and most states require consistency with respect to Itemizing or Standard Deduction. So, if the taxpayer uses the Standard on the federal no problem----that deduction doubled. But what about the states; they did NOT double their Statndard Deduction. This is the conundrum JudyMo finds herself in. There are a few large cities in the US that add another layer of complexity; Kansas City is one of them. It's problematic because many in the area work in MO but Live in KS (Johnson County in particular). This results in generating a "Crossfile" between states. in a nutshell....if you make over $75,000 and file jointly, you might seriously want to think about having an extra $20/pay period withheld or you could be left holding the bag at the end of the year...a very empty bag. Yeah, I'm not a fan either. The new rules do not favor things that have been a part of US law for a long time. It does not favor home ownership,families, marriage,or support for local services provided by the states. It does favor estates and landlords. go figure. There is a tax credit , a temporary measure , that was added in which kind of replaces the personal exemptions. The exemption lowered your taxable income-this cuts down on the tax owed. It is a not refundable credit. s of 2018, you can also claim a tax credit for dependents who are older than age 16. The TCJA provides for a Family Tax Credit now as well. It's only worth $500, but that's better than nothing. Most of the qualifying rules are the same as for the Child Tax Credit, except adult dependents don't have to have valid Social Security numbers. Your dependent will need an Adoption Taxpayer Identification Number (ATIN), however, or an Individual Taxpayer Identification Number (ITIN). Unfortunately, this credit is not refundable, so the most it can do is shave $500 off your tax bill for each qualifying dependent. what this tax change has done for some has complicated their taxes significantly.